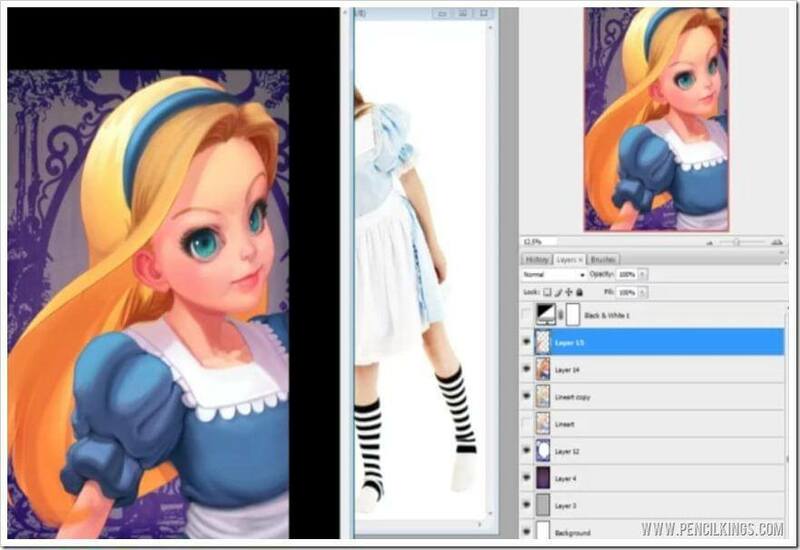 Want to learn more about painting hair in Photoshop? Now we’ve finished working on the body and clothing, we can return to the hair and really work this so we end up with beautiful flowing locks. Painting hair may look tricky, but once you’ve picked up Sycra’s awesome tips and professional trade secrets, you’ll be going with the flow and creating amazing effects in all of your other works! 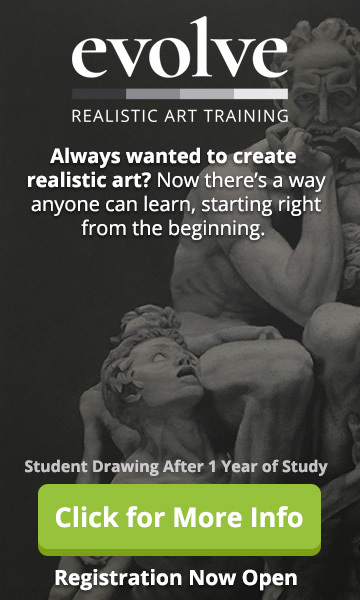 So, pick up your stylus and let’s get started! Before you can get started on the hair, you need to just adjust a few brush settings to get the right tools for this job. 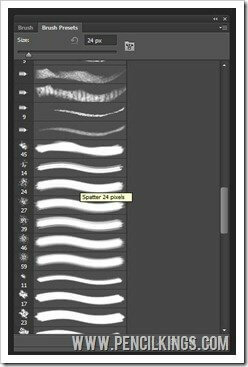 For this lesson, you’ll be using a 24 px Spatter Brush, so select this by hitting F5 to bring up your Brushes window. Next, go to your Brush Settings and check everything is looking good. Shape Dynamics should be set to Pen Pressure and Spacing should be set at two percent.Now, create a new layer and make sure you’ve got your reference photos open – you’ll need these to work from as you start adding texture to the hair in your painting and picking up areas of shadow and highlight. Let’s Start Laying in Some Locks! We’re now ready to start laying in some locks. 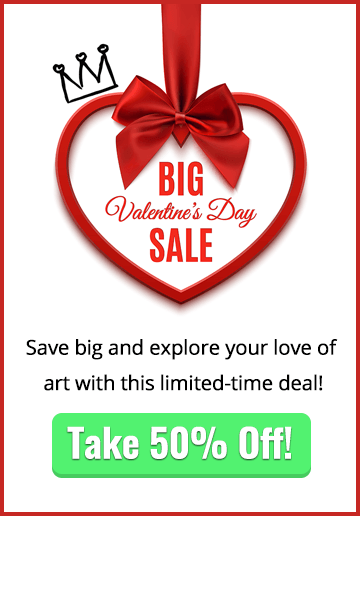 Create a new layer but don’t make this one a clipping layer – this is because you want the freedom to be able to go over the other lines in your painting to create realistic flowing hair. 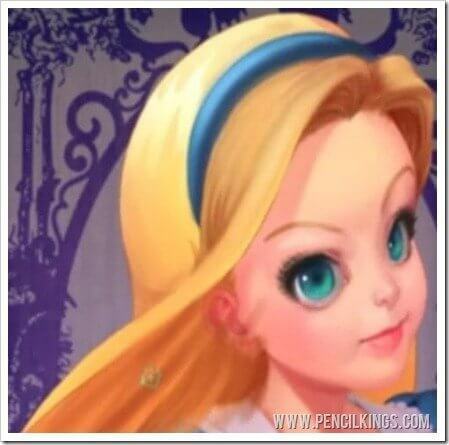 When learning about painting hair in Photoshop, remember you can always erase any mistakes later on in this new layer.Use the same technique when painting the hair as for other parts of your painting. Keep picking up colors and then blending those lines in. If you look at the reference photos, you’ll notice the hair gets quite dark in places, so try to adapt this for your own painting and block those heavily-shaded areas in. Use long, confident brush strokes and don’t forget to add in some lighter areas as well as dark. When learning about painting hair in Photoshop, try and think about how the hair falls and establish which sections fall behind others. It’s a good idea to paint these areas first and then go back over them later with the hair that’s falling in front. Change your brush size as you work on different areas of the hair and follow the flow as it matches the contours of the head. If you look at your reference photos, you’ll see that the hair doesn’t always fall neatly upon the head. There are lots of wavy strands blowing in the breeze and this would be a cool effect to include in our painting too. 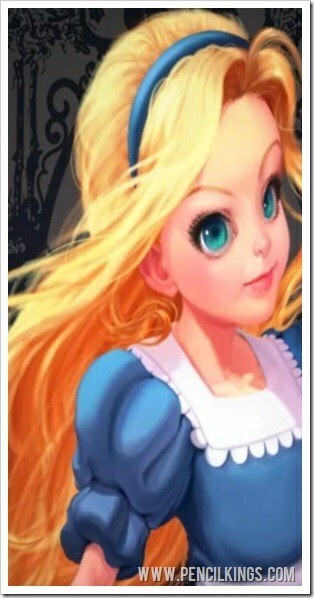 So, to do this, pick up some of the lighter hair color and go wild with the brush! Add some long, sweeping lines using light and dark shades and change your brush size accordingly. Try and think about where the light is falling and take advantage of the freedom that painting hair gives you. In other parts of your painting, you had to be real precise to get the effects you wanted. Now, you can throw caution to the wind and express yourself! Once you’ve added all those long flowing locks of hair, go back in and blend some of them. You can also use your Smudge Tool again at this stage to pull the hair and create a super realistic feel. Another technique when adding highlights is to use the Color Dodge mode. To do this, select the Brush Tool from the Toolbar and change the mode to Color Dodge. Once you’ve done this, you can select a color to work with. When using this method, Sycra tends to stick with a gray color and drops the opacity of his brush down to around 15 percent. Now, when you start painting, you’ll see highlights appear in your brush strokes. Color Dodge is an awesome technique but it’s also very strong. Therefore, it needs to be used sparingly in order to create impressive but subtle effects. 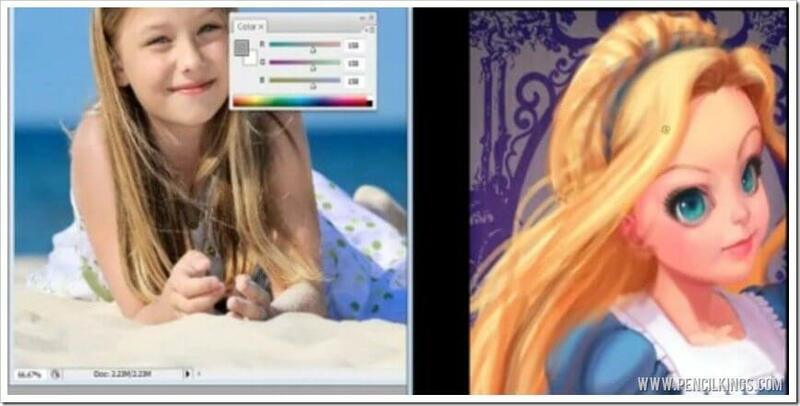 You can also change the mode of your brush to Color Burn, which will add darker areas instead. Have fun and experiment with these different brush modes – you’ll find they’ll be useful in every other aspect of your artistic career! Keep adding brush strokes and blending until you’re happy with the result. 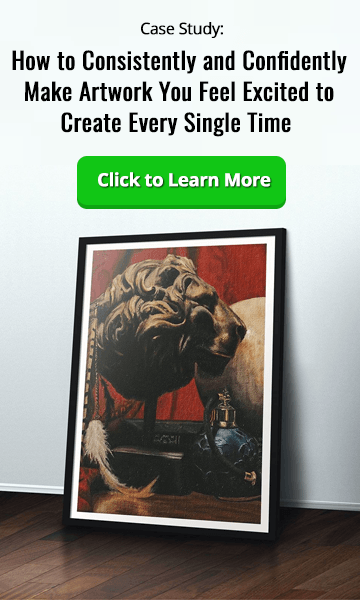 This is quite a time consuming process, but it’s really worth taking the time to do this is you want to achieve impressive flowing locks of hair in your painting. 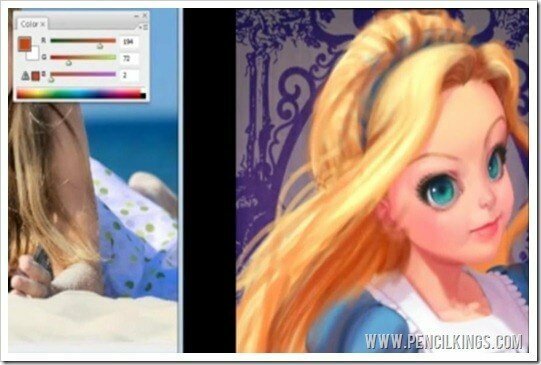 We hope you’ve enjoyed unleashing your creative potential while learning about painting hair in Photoshop. 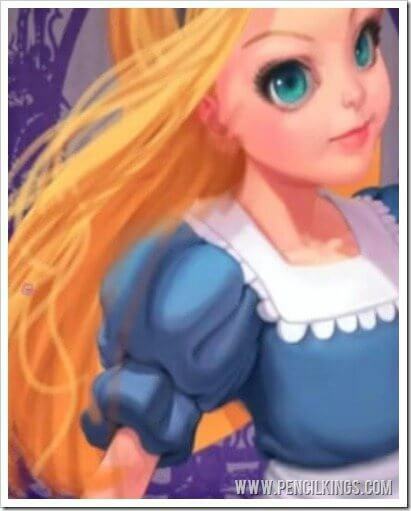 In the next, you’ll be learning how to add the finishing touches to the hair before moving on to complete your fully-rendered digital painting of Alice. Don’t be shy – let us know how you’re getting on by leaving a comment below!